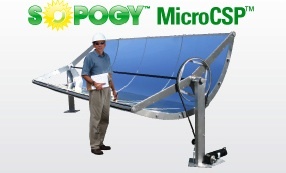 The small-scale solar thermal startup Sopogy that we reported was in the process of raising a $9 million round last October, has closed that round from investors including the investment vehicle of eBay founder Pierre Omidyar, Ohana Holdings. The folks at New Energy Finance reported the news, and after digging through regulatory filings, Nathaniel Bullard, senior analyst at New Energy Finance reported that the $9.1 million round also included local investors Bethel Tech Holdings, Energy Industries Holdings, Kolohala Holdings, Black River Asset Management and Hawaiian video game entrepreneur Henk Rogers. The Solar Millennium starts NOW ! Water for the deserts of Africa and America, Power for the People; Energy Revolution, Solar Millennium ! The latter is also the Name of a Company, awarded with the ENERGY GLOBE AWARD in the category Fire . 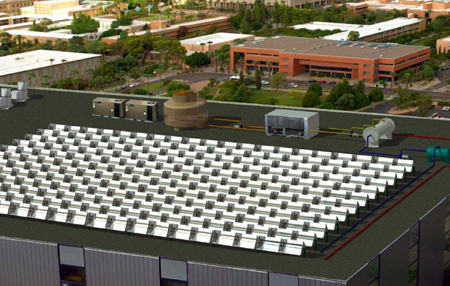 This company currently builds the first real utility scale solar-thermal power plants in Spain. The German Magazine â€œDer Spiegelâ€ wrote â€œHow Europa gets rid of Coal and Gasâ€ and â€œThatâ€™s how Oil becomes redundant for the USAâ€ and refers to visions that can become reality in the next decade. And it can be achieved by building parabolic mirrors in sunny regions to produce steam to run a turbine and power generation. These solar thermal power plants are running so efficient today, that soon economies of scale will allow them to replace traditional energy production. Remaining process heat can be used to for sea-water desalination. Hence the ideal spots for such power plants – sunny and not too far from the sea – are usually in need for drinking water. Parabolic mirror power plants, as those built in Spain, accumulate energy in molten salt tanks and are able to produce power also during the night time. The turbines run 7,5 hours after sunset and cloudy periods are bridged. With a co-firing of 10%-20% and with reasonable financing continuous power production and cost effectiveness may be achieved today, especially at utility scale. They are hence â€œfuel multipliersâ€, whereas utility scale photo voltaic power and wind wind power are just â€œfuel saversâ€ – â€œSun gone, Wind away: No more Powerâ€. To realize solar powered two digit percent fractions of energy production in Europe or the USA or to power entire cities, one can only build utility scale solar thermal power plants in the earthâ€™s sun belt. The power transport is not a big problem any more as high voltage DC-Transmissions just loose 3% per 1000km. The only reason these startups aren’t becoming sustainable is that they are chasing venture funding. In the old days, people started making things on a small scale and selling them as they could. Their business stayed ‘relatively’ in the black except for business loans. Today, the financiers mandate such a bloated business model that the startup owes $10-100 million before the first significant sale. Then their profit is sucked out of the business (to buy back that stock or offer dividends) during those years when that profit should have funded growth. Consequently, they have to go further into this extreme interest rate type of debt. It’s not a sustainable business model unless they can guarantee the public adopts it fast enough to sell millions of units in the first year or two. This is totally without regard to the actual economics of building those systems and selling them. On top of this, the investors look to the utility companies to tell them what tech is most viable and those guys keep recommending tech that isn’t threatening. Someone allow us small guys a way to funding where we aren’t judged on our flashy presentation, but rather on the technical merits of our systems and we don’t have to give away 51% to get a loan! I couldnÂ´t agree more with PF Wilson. Congratulations to these visionaries that arenÂ´t afraid of taking risks. Solar will eventually become a more wide-spread player in the energy market, but until they can get their cost-per-kilowatt below the price of coal’s and oil’s, solar will only be possible with subsidies. And once subsidies are introduced, it will be almost impossible to wean a solar electric company off those subsidies. So the solar company will operate inefficiently and unprofitably, sucking resources from the government (visa viz the people) to stay afloat. I’m a big fan of renewable energy like solar (I like nuclear a lot too, though it’s not technically “renewable”), but until the technology can be cheaper than coal on a cost-per-kilowatt basis, it will not be feasible. Now, if a few eBay and Google billionaires want to throw money at improving that technology, my hat goes off to them. Not only are they being entrepreneurial pioneers, but they’re taking a huge risk because the venture doesn’t have a profitable outlook. I hope they’re successful!